ENAA actively develops a lot of programs in connection with international cooperation and exchange. Backed up by the advanced engineering expertise and accumulated experiences of member companies, ENAA is engaged in cooperating with developing nations through dispatch of missions, the training and seminars for project management, holding of international seminars, joint research and development of appropriate technology. Highlighted below are the recent activity of international cooperation and exchange extended by ENAA. ENAA has been involved in survey and research on the development of economy and industries in GMS(Vietnam, Myanmar, Thailand, Laos, Cambodia and Yunnan province of China) on the three year basis from 2009 thru 2011 supported by our government. ENAA plans to conduct the comprehensive study on practical proposal for enhancing infrastructure along the South Economic Corridor Area in 2011 as the final year of the three year survey plan. ENAA conducted general survey for any possibility of the relevant associations we can cooperate with in South East Asia and Middle East region in 2010 with a financial support provided by the government. Based on the result of the survey and research as above, we plan to get involved in preparation works for establishing a workable network with the relevant associations in South East Asia in 2011. ENAA has been dispatching a delegation to PMI (Project Management Institute) Global Congress every year to keep a cooperative relationship with PMI and acquire update information relevant to knowledge and practice of project management in the world. These are also important for ENAA to promote people development program in the project management expertise. In October, 2010, ENAA participated in the aforesaid Conference held at Washington DC, USA. Furthermore ENAA participated in International Project Management Association (IPMA) World Conference held at Istanbul, Turkey in November, 2010. 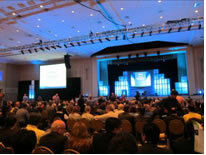 ENAA has been engaged in information exchanges with overseas organization through above mentioned conferences. Engineering industries in Japan enjoy high reputation in terms of engineering capabilities accumulated by developing design, procurement, construction, operation works and etc. for energy, chemical and other plant businesses in both domestic and overseas. Meanwhile, our member companies nowadays encounter very tough competition in overseas market due to increasing number of competent contractors, growing in plant size and complexity, diversification of contract/procurement, etc., and for that reason, it is in the pressing need to train highly competent project managers responding appropriately to these situations and changes. With the above, ENAA has been engaged in the training programs of human resources expected to play a core role in engineering industries. These programs are developed by the Industry-Academia Human Resources Development Department of ENAA in close cooperation with private enterprises which own practical experiences and know-how and universities which support the theory of management. -Advancement of enterprise productivity and profits. 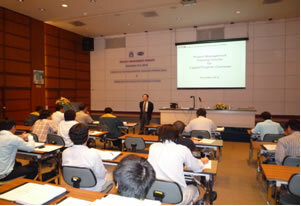 -The first seminar in Thailand in 2009. 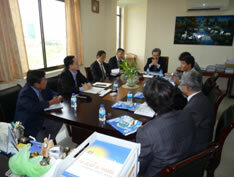 Asian countries are planned in 2011.